Shan’t money lack or have debts to pay. Nottingham is rightly famous for its Goose Fair which takes place at the beginning of October each year. Its story extends at least some 700 years back into history. Goose Fairs were held around Michaelmas (29th September) when the harvest was over and the Geese were starting to fatten up picking grain left amongst the stubble in the fields. A “Stubble Goose” was a traditional feast dish for Michaelmas (in Christianity the Feast of St Michael the Archangel, marking the beginning of Autumn and the last day, according to Folklore, on which Blackberries should be picked). The carcass of the Goose was then used for making Michaelmas Broth. 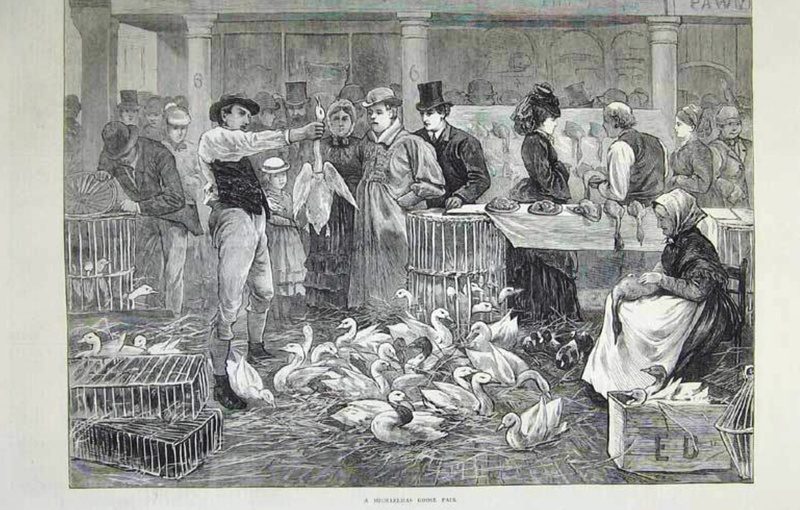 Story tells that thousands of Geese were driven from Lincolnshire and Norfolk to be sold in Nottingham, in the old Market Square and that this is the origin of the modern fair, which sadly no longer sells geese, but is now one of the largest (and oldest) travelling fairs in the world. Nowadays, for the most part, if people eat goose it is at Christmas time (and indeed is traditional in our household) so trying to buy a Goose for Michaelmas is no mean feat, unless you know a good butcher. The supermarkets don’t have their Christmas geese in yet, not even the frozen ones, but if you persevere you should be able to find one. Folk legend has it that you shouldn’t harvest blackberries after Michaelmas as the berries will be sour because this was the date on which Satan was banished from Heaven by St Michael and fell to earth. The Devil landed in a backberry bush which he cursed in his anger and stamped and spat on (some stories say that he also peed on it!) from this date the fruit is too sour to eat and it is still sometimes known as “Devil Spits Day” (of course, if the fruit is still on the bush by now the weather is too cold and dark to ripen them so they will be sour). There are many traditions locally associated with Goose Fair, including, of course, a traditional Nottinghamshire Michaelmas Feast of Goose and Blackberries. There are some recipes for a traditional Michaelmas Pie on the internet but not many, so I have gone for my own version of the Michaelmas Dumplings recipe created by Karen Burns-Booth of Lavender and Lovage. Prick the skin of the Goose all over and remove any excess fat from inside the body cavity. To make the stuffing – lightly fry the onions in the butter until softened. Chop the goose liver finely and add to the onion, cook gently for a couple more minutes. Stone and chop the prunes (or berries) and add, along with the port, to the onion and butter mix. Cover and simmer for around 5 minutes and then add the breadcrumbs and mix together. Push one Apple to the rear of the bird and then add the stuffing, close the neck with the second apple and truss the neck skin together. Weigh the bird now to get the correct cooking times. Roast on a rack in a roasting tin, it will produce a lot of fat which you can use to baste the bird (and also drain off to use for the best ever roast potatoes). Goose is very rich, so I suggest you serve with mashed potatoes and something tart, like red cabbage with cranberry sauce. 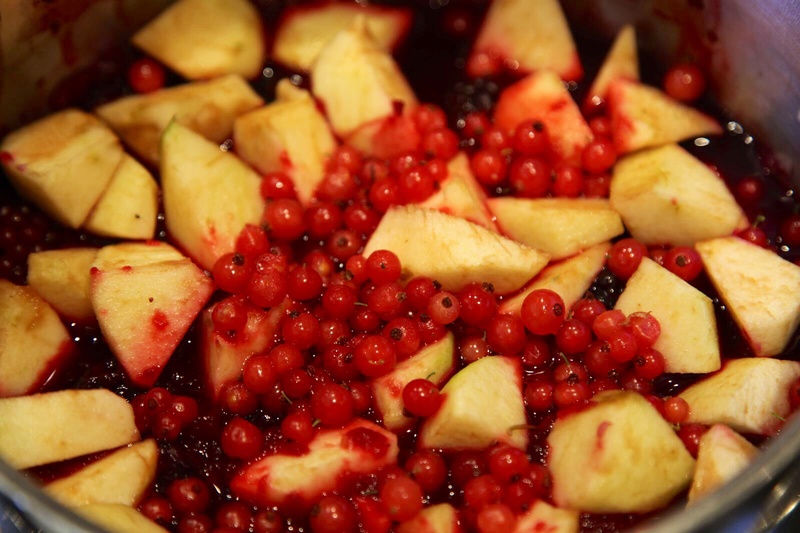 Rinse the blackberries and peel, core and 8th 2 cooking apples. 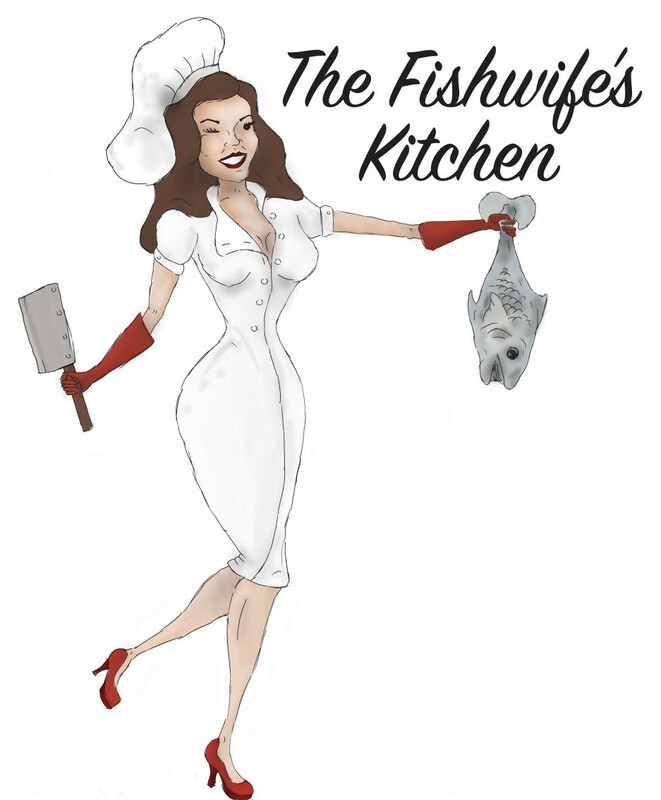 Place the flour and the salt in a mixing bowl and rub the butter or margarine into the flour. Stir in 3 level teaspoons of white sugar and then mix to a soft dough with about 8 tablespoons of cold milk. Divide the dumpling dough into 8 pieces on a floured board and lightly roll out to a disc about 4/5 inches in diameter carefully wrap the dumpling dough around each piece of apple, making sure that the apple is completely covered. 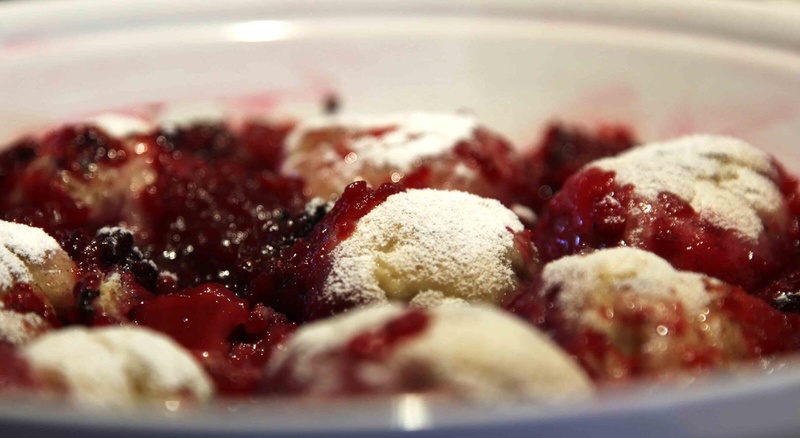 Dissolve about 2 tablespoons of sugar in the water in a medium saucepan and add the blackberries, reducrrants and diced apple (or whatever autumn fruit mixture you choose – plums might be nice). Bring them to a gentle boil and then place the apple dumplings on top of the fruit, cover the pan and simmer for 25/30 minutes. The lid should stay on (no peeking!) for at least the first 15 minutes. Serve with custard or single cream.